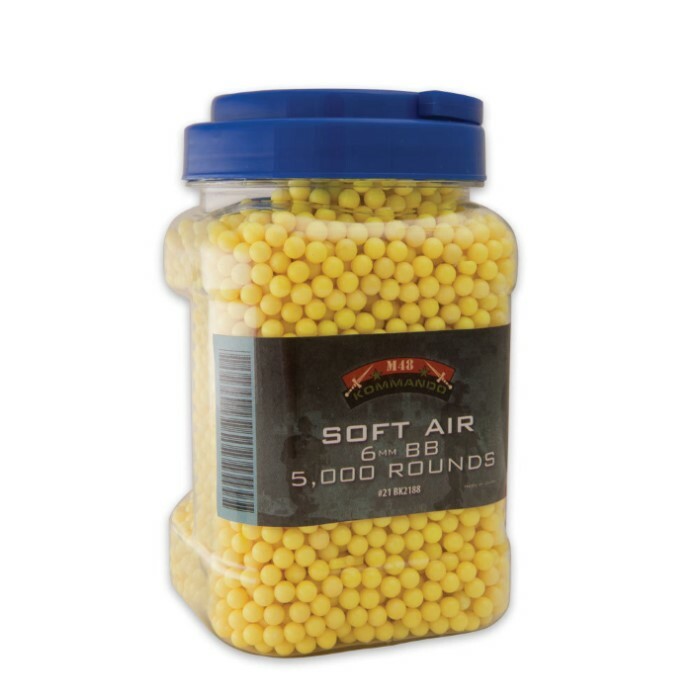 Airsoft BBs - 5000 Count Bottle | BUDK.com - Knives & Swords At The Lowest Prices! These deformed and partial bb's have destroyed two battery operated airsoft rifles because first they jam and then the gear box strips out. DO NOT USE in a battery operated gun. I bought these for the 2 for 1 deal. I thought they would be great because they're m48. After loading them into my guns they just would not stop jamming! I then found some cheap bbs at walmart and they worked fine. Do not buy if you want good quality! This is a MASSIVE bottle of bbs, they are adequate in quality, my only problem is that when it was shipped the cover fell off and the bbs went everywhere, they were all there though (after I refiled it I had many left that wouldnt fit in the bottle and had to be placed in the mag of my gun. A MUST FOR ANYONE WHO HAS AN AIRSOFT BB GUN!!!!!!!! arrived very fast and all looks good worth the money for 5000 bullets its worth it.